ISLAMABAD: Nov 19,2018: To share their recommendations to address the issue of climate change and its impact on Pakistani children, a delegation of civil society’s representatives met with the State Minister for Climate Change, Zartaj Gul today. In the meeting with the minister, activists discussed their observations and shared recommendations to minimize the climate change impact on children. They further offered their technical assistance in this regard with complete action plan as they work at the grassroots level and have expertise which can help in making the Government more effective. The delegation was led by activist and documentary filmmaker Haseeb Khawaja. 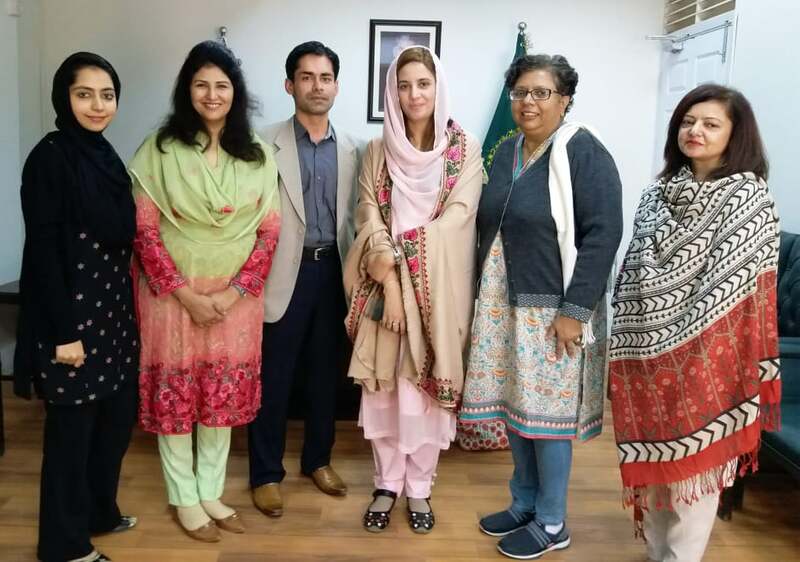 Zartaj Gul, Minister of Climate Change, has appreciated activists’ concerns and recommendations and said that she is eager to work with civil society’s visiting activists to make Pakistan climate-resilient country, to see it clean and green and a better place for all especially for children and women. Haseeb Khawaja said, ‘as for as children’s issues related to climate change are concerned; well he believes children are identified as most vulnerable to its impacts and must therefore be in the forefront of Government’s climate change policies, researches, advocacies and dialogues. Essential rights of children e.g. having nutritious food, attending school, enjoying good health, prospering in a decent environment, etc are directly threatened by climate change in Pakistan. Climate change is an urgent challenge for the Pakistani children which need to be addressed on emergency basis because children are the least responsible for the causes of climate changes. He further said, Pakistan is bound to take necessary measures to ensure child rights as Pakistan has already ratified international treaty ‘UN Convention on the Rights of the Child (UN CRC)”, according to him 15 rights of children (mentioned in the UN CRC) are particularly at risk from climate change. Ibtesam Qaisarani (GD Pakistan) highlighted Group Development Pakistan is a non-governmental organisation working for Child Rights. We believe that climate change has a profound impact on child rights, and issues of gender violence. Each is interlinked with the other. Civil society representatives present on occasion included Haseeb Khawaja (Activist & Documentary Filmmaker), Aliya Syed (Rotary Club of Islamabad (Metropolitan)/ FKP), Ibtesam Qaisarani (GD Pakistan), Rabia Arif (Hashoo Foundation) & Shazia Naz (Penny Appeals).